Mark Knopfler seems to be undergoing something of a revival in recent years. His commercially-revered, critically-reviled band Dire Straits, departed for more than two decades, are in the midst of rightful reappraisal by the music press and the influential touchstone for acclaimed bands such as The War on Drugs and Mumford and Sons. His most recent solo album, Tracker, reached a career-peak of #3 just last month. Knopfler has always been the furthest man from the concept of cool, but he suddenly seems to be, at the age of sixty-five, more relevant than perhaps he’s ever been. Mark Knopfler, onstage at Motorpoint Arena Sheffield, 2015. His show at a reduced-capacity Manchester Arena, the second night of the Tracker Tour, saw Knopfler and his seven-piece band (plus additional guests) serve up a two-and-a-half hour set that, despite the call for the classics, stubbornly resisted for the most part to conform to a show half filled with tracks from his former career as the frontman of one of the biggest bands in the world and material that packed a punch. Knopfler has fallen easily into the role of an avuncular elder statesmen of bluesy rock, peppering his band introductions with wry asides and drawing applause with commentary on Liverpool FC’s Premier League loss. With material culled from five solo albums, two soundtracks and, in concession, a quartet of Dire Straits songs, Knopfler led with new album track Broken Bones before a strident march through material from his previous LP Privateering, giving a chance for the man to impress on the acoustic guitar. Sound issues that had rendered the mix somewhat unintelligible throughout the opening stretch were fixed by the time of Father and Son, an instrumental from the Cal soundtrack, which segued nicely into stand-out fan favourite Hill Farmer’s Blues. Again, there are surprises in the setlist – there is no room from Tracker single Beryl, arguably Knopfler’s poppiest moment in years, whilst long-time live mainstays such as What Is It, Sailing to Philadelphia and Down with Bonaparte are all absent. Guest performer Ruth Moody performs backing vocals on a pair of tracks, Kingdom of Gold and new cut Skydiver, before she is replaced by saxophonist Nigh Hitchcock who plays on I Used to Could and Dire Straits classic Romeo and Juliet. 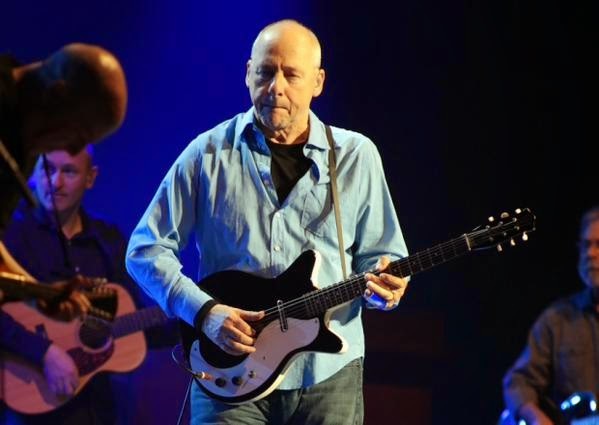 Here, Knopfler’s voice begins to truly assert itself – never a superbly articulate vocalist, his half-spoken mumblings begin to shape into familiar semi-sung words that give a weary edge to his words, buoyed by the gentle melodies and tones of his guitar work. The band halves itself to Knopfler, rhythm, bass and drums for a frenetic, elongated rendition of Sultans of Swing that brings a nice change of pace to the show – up until this point, the music has been pedestrian at worst, and executed flawlessly, but the downside of the Celtic leanings are that, in an arena setting, it can feel like a long drag. Mark Knopfler and band, on stage at Manchester Arena, 2015. The full band returns and for the next two numbers, the fresh momentum garnered feels like it is about to be lost inside the wall of sound. But an exuberantly-lengthened version of Marbletown (a live staple that concludes with fiddle, double-bass and piano solos) cements a resurrection, followed by the driving Speedway at Nazareth and an epic rendition of Dire Straits’ Telegraph Road, arguably Knopfler’s finest technical performance of the evening. So Far Away, the single from Brothers in Arms feels a slightly jarring choice of encore opening – predominantly synthesiser driven, it feels heavily at odds with the pastoral folk and blues of the night, but is well-played and gives way to a reappearance for Moody and Hitchcock – firstly, on Shangri-La cut Our Shangri-La, followed by Tracker’s duet with Moody and beautiful album highlight, Wherever I Go, before a fitting conclusion with Knopfler’s instrumental epic Going Home, taken from his first soundtrack, to the film Local Hero. It gives the evening a final hurrah, a fond wave into the sunset for the band and the crowd leaves, satisfied but perhaps not in enthral of the man. 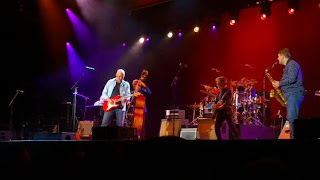 Knopfler certainly knows how to play guitar, and the man can conjure tones like no other from the depths of a six-string – but perhaps a better pacing between his faster hits and gentle meanderings may have given this show the musical punch and stride it often lacked.